At this unique wedding venue, with its magnificent state rooms and expansive parkland, you are able to design your own wedding exactly as you wish. They don’t like to offer packages, they like to work with you to create the wedding day you want. Their experienced and caring Wedding Planners will help you create your unique day down to the last detail. The exclusive use of the Georgian Palladian Mansion together with their experienced staff and bespoke wedding service ensures that civil ceremonies and drinks receptions will certainly make your special day one to remember. The versatility of the Hall means they can accommodate 110 guests for a seated wedding reception. However if your numbers are larger then they can help you design a marquee wedding working with their handpicked suppliers. Exchange Your Vows in the perfect setting. At Hagley Hall they understand that the ceremonial room needs to be perfect for such a special occasion. Therefore they can offer a selection of rooms for you to get married in so that no matter what your desires for your special ceremony are, you are sure to find a room that suits your style. The Saloon, with its ornate plasterwork, offers the most beautiful and historic setting with quintessentially English views of the village church and cricket ground. The room is arranged with two rows of seats facing towards the ceremony table leaving plenty of room for a generous central aisle. Two ornate chairs are placed at the table waiting for you are your partner to use during the ceremony. If your numbers are larger then the Long Gallery, with its breathtaking chandeliers and enchanting views of the deer park, makes for a fairy tale setting and, at 26 metres long, is the perfect for showing off your wedding dress! For smaller parties the Library offers intimacy and romance and provides a wonderfully snug location for as few as two. After the ceremony, enjoy champagne and canapés in the White Hall serenaded by a string quartet or even a solo pianist on the family’s baby grand piano. The Hall is flooded with sunlight and its wonderful arched lobby and scagliola figures of the Gods, including Bacchus and Venus, offer a fantastic setting for photography. If you were looking simply to get married here then they can offer this historic house for a civil ceremony and drinks reception for up to two hours. This gives you plenty of time for the exchanging of vows, drinks and nibble with your quests and plenty of photo opportunities. If you want to design your own menu to your exact taste then Hagley Hall is the perfect venue for your celebratory meal. And, as they use a hand-picked selection of the best caterers the region can offer, you are guaranteed you get the exquisite dining experience that you deserve for your wedding meal. Their designated team of Wedding Planners will work with you and your chosen caterer to create a menu that suits your taste and style of wedding. 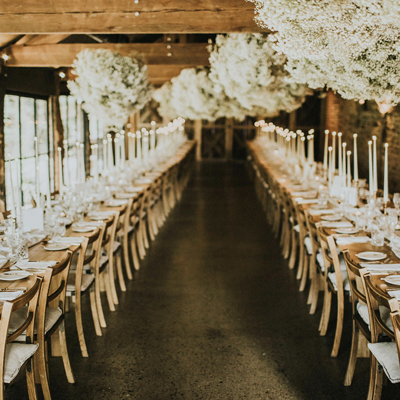 Choose from a traditional long top table for as many as you desire or go for something a little more contemporary and seat the wedding party in the middle of the room under the central chandelier at a round table seating up to 12. The Long Gallery, seats 110 people on round tables of 10 with a traditional long top table providing lavishness in both style and decor. For smaller parties the Saloon can seat 60 on round tables while the Crimson Dining Room, is ideal for an intimate wedding receptions for up to 28. Unlike most venues there is a completely separate area at Hagley Hall for your evening reception. Their entertainment suite consists of a disco room with a dance floor with an adjacent lounge and bar area and can accommodate up to 150 guests for your evening celebrations. It’s like getting two venues for the price of one! They can stock the bar to your exact requirements so rest assured you will be able to get your favourite tipple on the night. Exclusive use of this unique venue for nine hours up to midnight. Their experienced Hospitality Manager to help organise your wedding from start to finish. Maitre d’ to co-ordinate your day so that it all runs smoothly. Photographic opportunity in State Rooms, Perron Steps and Front Lawn (weather permitting). Use of the Chinese Silk Suite for the Bride to change and pamper. Use of the Lyttelton family antique silver cake stand and knife. Antique-style chairs & trestle tables both round and rectangular. If you have larger numbers then you can arrange for a marquee to be placed in the grounds with the Hall and parkland as a spectacular backdrop. They have two level marquee sites that are supplied with power and water. The East marquee site is perfectly situated close to the hall and you can run a canopy from the hall itself to provide your guests with a covered walkway. It can cater for numbers up to 500. The front lawn situated in front of the house can hold a function marquee for up to 1,000. Both sites are very close to the hall and you can benefit from using the house facilities. If you choose a marquee with clear sides and gables then the wonderful views of the parkland and hall could still be admired from within. Don’t worry, you can still experience the splendor that the Hall has to offer by inviting your guests to a champagne reception before they dine in the marquee. Best Alternative Venue at the Midlands Asian Wedding Awards 2016.